Fronnor 5W Solar Water Pump Landscape Pool Garden Solar Fountains Solar Powered Decorative Outdoor Water Fountains For Small Pond | Fountain City Art Ctr. 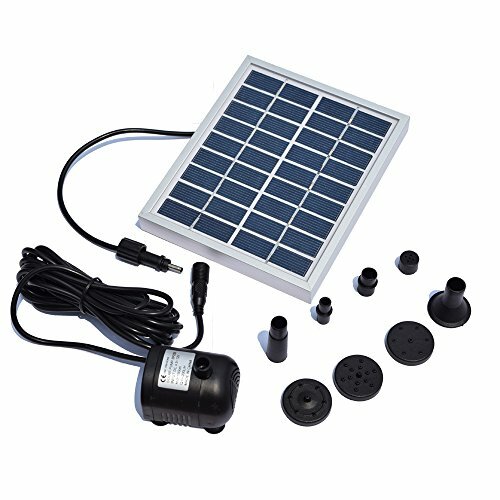 Water solar pump is designed for fountain, pond, or outdoor use Powered by solar: save money and energy. The pump is driven directly by the sunlight. So it will work continuously only when the sunlight is enough. As the power of the solar panel is depended on the sunlight, the pump is also affected by weather, seasons, places, etc. Don't make the pump work without water for a long time, or its lifespan will be shortened.Don't put the solar panel and the control box in water, or it will be damaged.